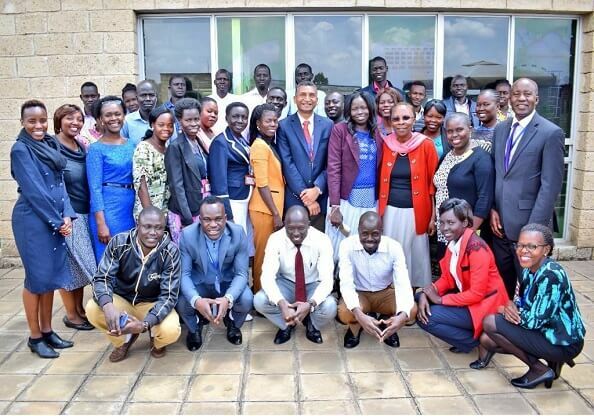 30th October marked a momentous occasion where the Vice Chancellor Designate Dr. Vincent Ogutu, welcomed the South Sudanese students to Strathmore as they pursue a course in Capacity Building in Peace and Conflict Management. The GIZ Governance program has been working on decentralization and service delivery in South Sudan since 2007. In September 2018, the School of Humanities and Social Sciences signed an agreement with GIZ South Sudan for a 9-week training on Capacity Building in Peace and Conflict Management. There are 30 students in the program 20 of whom are from local South Sudanese NGOs and 10 from CoMNeTSS, a South Sudanese radio network. The course aims not only to educate the group on tools of advocacy, peacebuilding, ethics, and good governance but also to effectively use the media to do good. Social media, radio education programmes and scripting are some of the tools used within the course to educate on peace. The radio programmes are to be aired in South Sudan, using local language and metaphors with topics touching on conflict, managing expectations, and transformation. With this, both GIZ and Strathmore hope to stir up continuous debates on public policy, non-violent conflict transformation, and good governance. It is hoped that this will be one of many similar courses, that will eventually create a ripple effect, even if only a small one, to positively help and gradually transform Southern Sudan.